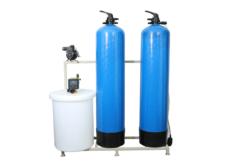 Multi Grade Filter: Filter provided with graded sand, pebbles and activated carbon for the effective removal of Suspended particles upto 50 microns, free chlorine, odour present in raw water. Result you chlorine free water. Provided with Multiport valve for easy operation. Micron Cartridge Filter: A PP Housing provided with 5 Micron Wound Cartridge that removes upto 5 Micron. Result you crystal clear water. Water Softner: A Water Softening Plant provided using Ion-Exchange Technology for the removal of Calcium and Magnesium Salts which will precipitate white scales (hard salt) inside pipelines, water heaters, showers and showers by exchanging Sodium Ions through brine solution. A common salt (NaCl) is enough to regenerate the Ion Exchange Resin. Tank for Brine makeup & Hardness test kit will be provided. Kitchen RO System: A 10LPH kitchen RO plant will be provided and connected to kitchen pipe and delivers 100% Pure and Safe water for drinking and cooking. 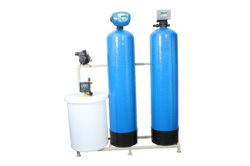 Multi Grade Filter: Filter provided with graded sand, pebbles and activated carbon for the effective removal of Suspended particles upto 50 microns, free chlorine, odour present in raw water. Result you chlorine free water. Provided with Auto Multiport valve for easy operation. Municipal / Borewell with sediments / TDS & Total Hardness upto 2000&800 ppm. Looking for Whole House Water Purification Systems ?